During her tenure as Clara and Robert Vambery Distinguished Professor of Comparative Studies, MITH fellow Hester Baer will be collaborating with an international group of scholars to convene a conversation around feminist activisms through digital lectures and discussions on social media. This exciting series of lectures starts today. 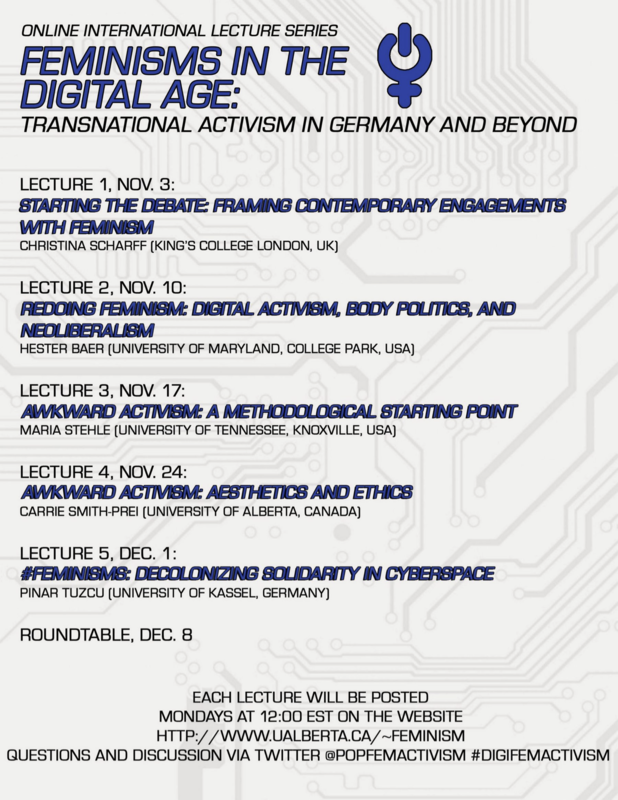 “Feminisms in the Digital Age: Transnational Activism in Germany and Beyond” is a digital lecture series that explores the political impact of feminist activisms in the 21st century. In five lectures and a concluding roundtable, we interrogate the digital interface of transnational protest movements and local activism in feminist politics. The lectures take contemporary German protest culture as a case study for the manner in which transnational feminist activism intersects with the national configuration of feminist political work. We explore how movements and actions from outside Germany’s borders circulate digitally and resonate differently in new local contexts, and further, how these border-crossings transform grass-roots activism as it goes digital.